Sorocold was to make his mark throughout Britain in the development of urban water supply and distribution systems, ones that take a form that we would recognise today. The first of his systems was begun in 1692 in his adopted home town of Derby — Derby Waterworks. In 1691, Sorocold had offered to provide an 'engine' to raise water from the River Derwent and to distribute the water around Derby in wooden pipes — providing a direct supply to private houses and businesses for appropriate payments. The town fathers recognised the need for this service but were unable to finance it, so they took out a number of loans, including one for £41-16s from the Derby Mercers Company, a loan which has yet to be repaid! The following year it was agreed that the engine (a variable height waterwheel driving a pump) should be installed on an island in the River Derwent known as the Bye Flatt, in Gunpowder Mill, which was a building they evidently owned. A deed to authorise the project was signed by both parties and work started soon afterwards. Despite much searching, no trace of the deed has been found. Unfortunately, many records held by Derby Local Studies were lost in the floods of 1932. "Deed whereby the Mayor and Burgesses of Derby grant to George Sorocold, of Derby, gent, the mill, commonly called the Gunpowder Mill, near St Michaels Mills, and two sluices adjoining, and the Little Byfleet whereon the mill stands with free liberty to erect a waterhouse, a water wheel and other engines, laying pipes for conveying water into the streets, lanes and passages within the Borough, to hold for 99 year at an annual rent of £3-00 with certain conditions as to opening the streets, digging tranches, and repairs etc. the said George Sorocold to begin work within three months next ensuing, and to lay pipes through 'The Kinges Streets, Iron Gate, Market Place, Rotten Row, and Corne Market in Derby, and so to Goal Bridge in the said Borough within the next three years following'." On the reverse of the entry is a memorandum stating that Sorocold, on completion of his waterworks, may "have the liberty to surrender the lease, leaving the said water house, waterwheels, sluices, bridges, pipes, pavements etc in good repair". Jeayes notes that the deed was signed and dated 5th March 1691 by the mayor Samuel Fletcher and by Sorocold. It was witnessed by town clerk John Bagnold, and by Thomas and Joshua Bourne. Little visual information about 1690s Derby has come to light, nor is there a plan of it for this period. However, John Speed's map of about 1610 (see at left) shows a small town on the west bank of the river, maybe 550m north to south and about 275m wide. It's likely that the town grew modestly in the intervening years. The market place, still in the same location today, was dominated to the north by a row of merchant's shops known as 'Rotten Row'. Main roads included the Corn Market, the Wardwick, Saddler Gate, Walker Lane, the Morledge and Friar Gate. There was probably little building to the south beyond what is today known in Derby as 'The Spot'. The only river crossing — taking travellers to Nottingham and Chesterfield — was the masonry seven-arch St Mary's Bridge (now replaced), close to which Sorocold built his waterwheel in the mill building referred to in the Deed. This site is near to where the Cotchett Silk Mill would be constructed a few years later, and has been identified through the recent discovery of an 1852 Borough Engineer's linen map, together with an 1883 photograph (see right hand column). William Woolley's 1712 History of Derbyshire (reprinted by Derbeyshire Records Society) estimates the population at about 4,000 people. Besides an assortment of lords, esquires, aldermen, lawyers, doctors and those of religious office, Derby residents included framework knitters, butchers, tailors, brickmakers, woolcombers, blacksmiths, and tanners. However, it was the lords and esquires, etc., who were willing to pay for piped water. Town resident Erasmus Darwin, for example, referred to having "continuous water" in his house. Sorocold's Derby Waterworks was the first of its kind outside London. It consisted of a waterwheel-driven pump that lifted water from the River Derwent and stored it in a tank for distribution. Historical maps show the site of the waterworks to be at the end of St Michael's Lane — a location that allowed river water to be drawn up-river of St Michael's Weir. 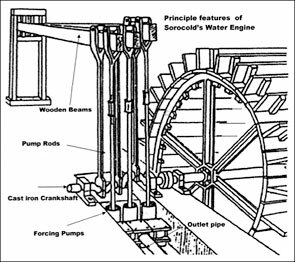 Sorocold's 'water engine' was notable, as its wheel could be raised or lowered as required by the level of water in the river. This principle was patented by Sorocold's fellow engineer John Hadley (fl.1689-1701) of Worcester in 1693. The tank (referred to as a cistern) was located at the nearby St Michael's Church, from where it fed a network of elm-wood pipes. The church is some 7.6m above river level, on one of the highest parts of the town centre, making it the best place from which to serve a gravity feed system. 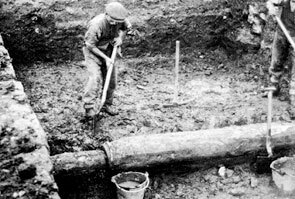 The distribution network consisted of some 6.4km of elm-wood pipes, which ranged in nominal bore from 25mm to 114 mm and served as many as 23 streets. Users appear to have been supplied by individual services. The wheel of the waterworks is said to have also driven the saw mill that was used to bore out the wooden pipes. No detailed drawings of the engine have come to light. However, Sorocold is credited with similar later works in many other British towns and cities, including Leeds and London. Drawings of these show complex systems that drove forcing pumps using a series of beams and pulleys, and are almost certainly the same basic configuration as used in Derby. An 1852 offer of sale for Derby Waterworks lists a waterwheel capable of generating 12 horsepower (about 9kW). Details of the holding tank are similarly sparse. It's unclear exactly where it was positioned. One historical source names the church tower, others say it was in the grounds. The topography of the site in relation to the layout of the streets supplied suggests that for the system to work, the tank must have been raised off the ground. However, it seems unlikely to have been inside the church tower unless considerable reinforcement was provided, as the weight of the water would have almost certainly damaged the tower structurally. The tank was most likely made of wood, lined in lead sheeting to make it waterproof, and located outside, raised on a timber or stone structure. A recently discovered 1810 request by the Church Commissioners to the Town Council asks whether, "the tank in the roof belonging to the water works could be removed as it is no longer used?". This suggests that a storage tank was built into the main roof (not the tower) at some point — possibly it proved insufficient in capacity and was replaced by the cistern in the churchyard. We can't be sure. A contemporary description of the waterworks is provided by John Houghton in 1693, who says, "... one Mr. George Sorocold has set up a waterhouse to convey water-pipes to all the houses in the town that desire it, and it is likely it will be much used ... ". Five years later, in 1698, pioneering traveller Celia Fiennes (1662-1741) noted that: "Ye River Derwent runns by the town and turns many mills, and ye water Engine wch turns ye water into ye pipes that serves ye town, ye same wheele grinds also, but they do it for a half penny a strike wch is the same measure as our Bushill. At this Engine they Can grind if its never so high a flood, wch hinders all ye other from working at ye flood, they are quite Choaked up, but this they Can set higher or lower just as the water is. There are bays wch they make wth stones to keep the water to run to ye mill and thence it falls againe into ye Derwent; there is also a fine stone Conduit in the Market place, wch is very spacious, well pitch'd a good Market Cross." The waterworks appear to have been sold on the 24th October 1705 by Sorocold to Thomas Coke (1674-1727), Member of Parliament and resident of Melbourne Hall, for the sum of £200. It's not clear if there were further individual owners. However, ownership was in the hands of a Board of Trustees throughout the 18th century and until the closure of the waterworks in 1848 (possibly as a result of the Town Improvement Clauses Act 1847), an astonishing 150 years after its construction. 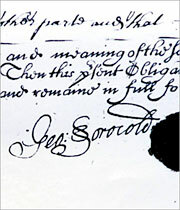 Sorocold was a Trustee up until 1738. Further ventures into water supply quickly followed the completion of Derby Waterworks. In 1693, Sorocold installed a water storage cistern at Macclesfield for the sum of £50. Complete waterworks systems were installed in English regional towns and cities, including Portsmouth, Leeds and Great Yarmouth in 1694, Exeter in 1695, Wirksworth and Bristol in 1696, Kings Lynn in 1698 and Bridgnorth in 1705. Even today, a visitor to the Shropshire town of Bridgnorth can stand on the banks of the River Severn and marvel at Sorocold's feat of engineering — water pumped to a tank on East Castle Street, some 33m above, powered solely by the flow of the river. In a letter from Sorocold to Thomas Coke, held in the Melbourne Hall Muniments, the engineer reflects on the professional enthusiasm he felt for this work: "Enjoyable project at Bridgnorth where I put my floating mill; Mr Whitmore found me £1,000 to build on a water wheel engine and cistern for the furnace of their Upper Town which lies much higher than the Severn than Nottingham does from the Trent." 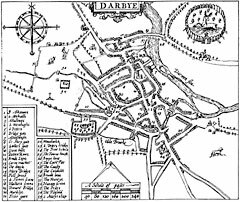 A map of Derby (circa 1610) by John Speed, included in his atlas The Theatre of the Empire of Great Britain. As no map has been found that shows Derby in Sorocold's time (late 1690s), it's the best guide we have to how the town may have looked when the waterworks were planned. St Michael's Church is at the northern end, below the letter Y in the title block, and the waterworks were located by the river, a little to the east. No detailed drawings of Sorocold's 'engine' for Derby Waterworks have come to light. However, drawings of later installations, such as the one above demonstrating the principal elements of a Sorocold engine, show complex systems driving forcing pumps using a series of beams and pulleys. Almost certainly, the same basic configuration was used at Derby. An amazing photo from 1883, looking north-north-west down the mill flume (artificial channel) once located behind the present Derby Silk Mill complex. 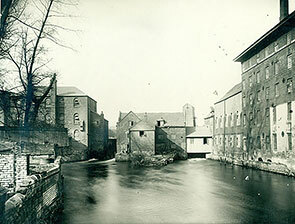 From right, the buildings are Lombe's Mill, Cotchett's Mill, then the medieval St Michael's corn mills at the far end. On the left is believed to be the Gunpowder Mill referred to in the Deed discussed in the text. Taken together with the map below, it is now certain that this is where Sorocold's water pumping engine for Derby Waterworks was installed. It shows an enclosed wheel house, with a chimney, probably serving a small fireplace that would have been used to keep the wheel from icing up in winter. Plan on waxed linen (1852) showing the site of Derby Waterworks, which we have tinted pink. It came from a set of documents from Derby Borough Engineers office (Box 6 Map 9). It clearly shows the building identified in the photo above, marking it as Old Water Works — the first positive identification of the exact location of Sorocold's pumping engine, linked to a contemporaneous photograph. The river is to the right, with an island in it. The central area is the flume, with a dotted parish boundary down the middle of it. Excavation in Queen Street in 1928 revealed part of the Sorocold water distribution network in Derby. A section of the pipe is now in Derby Silk Mill Industrial Museum collection. The photo was reproduced in the the Derby Telegraph, 10th June 2007. 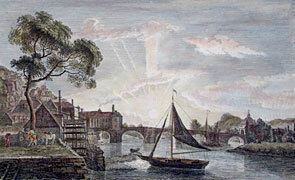 A 1770 aquatint of the waterworks at Bridgnorth, Shropshire, by Paul Sandby. Sorocold designed water supply systems for many towns in Britain following his success at Derby, installing a floating waterwheel on the River Severn at Bridgnorth in 1705. Water was pumped to a tank 33m above river level.